The Dogwood 'Isanti', Cornus sericea 'Isanti', is a fine-twigged Dogwood with red bark. White flowers in late spring are followed by abundant white fruit. 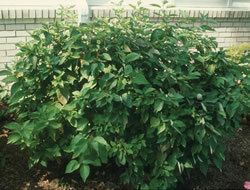 Mounding plants grow 4 to 5 feet tall and spreading 4 to 8 feet. Very adaptable and will thrive in sun or partial shade. Requires a soil with adequate moisture, otherwise adaptable as it tolerates wet sites. Isanti Dogwoods are slower growing and more compact than the species, making it more usable in the landscape than the species.